There is something exhilarating about having thousands of people scream your name each time you are out doing your thing. It is a feeling that is only best understood by experiencing it. It elevates a man from just flesh and blood to a god and at this point, your actions are capable of bringing joy and happiness to the lives of multitudes. To achieve this glory, however, it takes years of diligent practice, discipline and hard work and very few men are able to pay the price. One man who has committed himself to that journey is Kelvin Benjamin, the Buffalo Bills wide receiver. Let’s take further look at the life of the American football player. A 90s baby, Kelvin drew his first breath in Belle Glade, Florida. Not much is known about the upbringing of Kelvin Benjamin, we, however, know he was raised by his mother, Christine along with three other siblings in Belle Glade Florida. Benjamin was committed to sports early in his life. In high school, at Glades Central in Belle Glade, Florida, he ran track, played basketball and football. Benjamin proved to be quite the athletic and well-coordinated player from a young age. As a track & field athlete, he competed in jumping events. Finishing in third place at a 2009 Florida High Schools competition. He followed the feat up with a gold medal win at the 2010 Glades Central Invitational. In football, which he focused on as a career, Benjamin cemented himself as a wide receiver due to his speed and catching abilities. He finished his high school career as a senior with 30 catches for 551 yards and six touchdowns. By the time college recruitment season came around, Kelvin Benjamin was regarded as a four-star recruit by college scouts. Two of the top sports companies in the country, ESPN and Scout.com, ranked him as the 23rd player and 12th receiver in the country respectively. As a highly ranked player, college football scholarship offers were in abundance for Kelvin. Out of a pick of Virginia Tech, Auburn, Florida State, and Miami, Benjamin chose Florida State. Kelvin spent just two years at Florida State before moving on to play professionally at the NFL. But before he left, he made his mark at the University. In his first season as a college player, he played in the team’s 14 games and recorded 30 receptions and four touchdowns. He followed up on his successful first season with an even better record of 54 receptions and 15 touchdowns. He finished the season with a BCS title win over Auburn, scoring the game-winning touchdown. His remarkable second season earned him a place in the Sports Illustrated All American first team. After declaring for the NFL draft in 2014, Kelvin became one of the most sought-after wide receivers in the draft. His potential and past records made him an attractive prospect for a number of NFL teams. When the draft finally came, Carolina Panthers acquired Kelvin’s services with the 28th overall pick. After signing a four year $7.6 million rookie contract, Kelvin started his rookie season in competition with Jericho Cotchery for the No 1 wide receiver spot. He scored a touchdown in his debut and his performance in his first game earned him an NFL Rookie of the Week award. His first game performance was a sign of what to come from the Florida man and he finished his debut regular season with a strong 73 receptions and 9 touchdowns. He also had 1008 yards receiving. 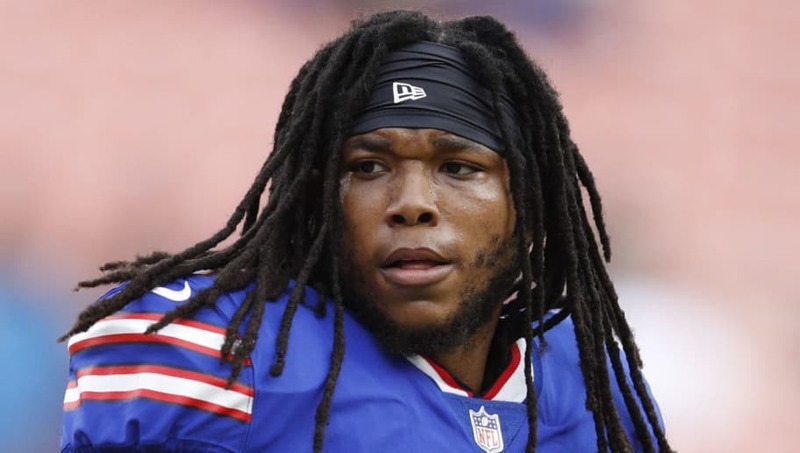 Unfortunately, Kelvin Benjamin was unable to follow up the exploits of his debut season after tearing his ACL during a practice session in the 2015 preseason. It ruled him out of the entire season. His return to the game in 2016 was not as explosive as his debut season, he was only able to record seven touchdowns, 63 receptions for 941 yards. Kelvin was traded to the Buffalo Bills for the 2017 season. He played 6 games in his first season with the Bills and finished with one touchdown, 16 receptions for 217 yards. Kelvin has suffered two significant injuries since the inception of his NFL career. He suffered an ACL injury that ruled him out of the 2015 season. In the 2017 season, he suffered a torn meniscus in his right knee and was out for two weeks. Despite his injury problems, Kelvin has been able to rack up some decent NFL career stats and with his injury problems behind him, there is still a lot to see from the wide receiver. So far, his career stats are 19 touchdowns, 184 receiving for 2641 yards in the regular season. In his postseason appearances, he has managed two touchdowns and 12 receiving for 117 yards. As a wide receiver, his body size is an important factor in his performances. Kelvin Benjamin stands at 6 feet and 5 inches and weighs 245 lb (111kg). His other body measurements put his arm length at 35-inches with a hand size of 10-inches.